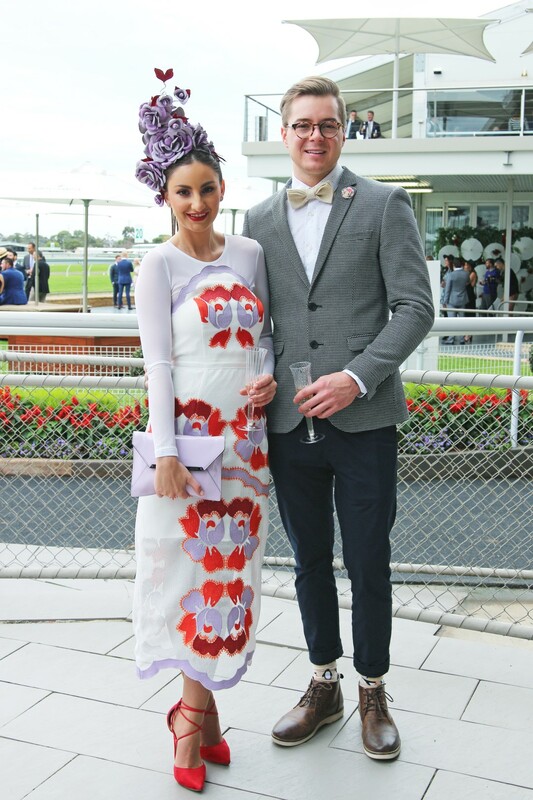 Last weekend saw the Schweppes Oaks Day races take over Adelaide’s Morphettville Racecourse, and The Adelaidian attended in the hopes of pinning down some fabulous frocks and headpieces to photograph… It was certainly no hard feat! Ladies and gentlemen alike dressed to the nines, and we found most of our favourite outfits in The Adelaide Set VIP trackside location. Here, navy suits were a classic option, and the most popular amongst the gentlemen on the day; for the ladies however, the outfits were incredibly diverse! Women wore everything from the likes of florals, monochromes, pastels, neutrals, and so many other various colour and pattern schemes – it was great to see such versatility in racewear. Below you will find just a few of our top picks from the day featuring stunning millinery, unique colour schemes, local brands and more! The beautiful floral fabric that Gabriella wears is none other than the design masterpiece of Alice McCall, perfectly fitting the Oak’s Day theme of floral/pastel. Paired with this outfit is a matching pastel Mimco clutch and an extraordinary hand-made headpiece made of leather lilac flowers from Joli Boutique in Melbourne. Everything about Gabriella’s colour scheme is absolutely on point! Accompanying the lovely Gabriella is Ash Joli, harnessing a very unique yet trendy style which is inherently race day ready. Ash wears a Trenery Blazer, Zara Shirt and General Pants pants! The statement woven bow tie is from Peter Shearer, matching some super cute penguin socks from Roger David. Olivia switches things up at the races with an exclusive TY-LR get up that has not yet been released (keep an eye out for its release soon though!). This burnt orange duo encompasses a separated set of pants and a deep, v-line top which, together, end up looking like an amazing jumpsuit! Olivia’s unique headpiece is from local millinery designer Melissa Barnes’ Adorn Collection. Unique and delicate, this piece works so well with the bronze-orange colour scheme. As Olivia suggests: “Everyone loves a good jumpsuit!” We definitely agree – a more modern outfit that deviates from the conventional floral-dress-and-fascinator combination is perfect for the races in 2016. Olivia’s Style Inspiration: Bright block colours with a statement piece. Nicole is wearing a pastel prize-winner from lovely local brand Finders Keepers. Keeping it feminine and sweet, this dress is paired with another local treasure: a gorgeously dainty golden Jamie Sortino headpiece. This lightly-coloureed outfit screams girly fun; we particularly love the short hem that reaches out mid-thigh paired with long sleeves and a high neckline. 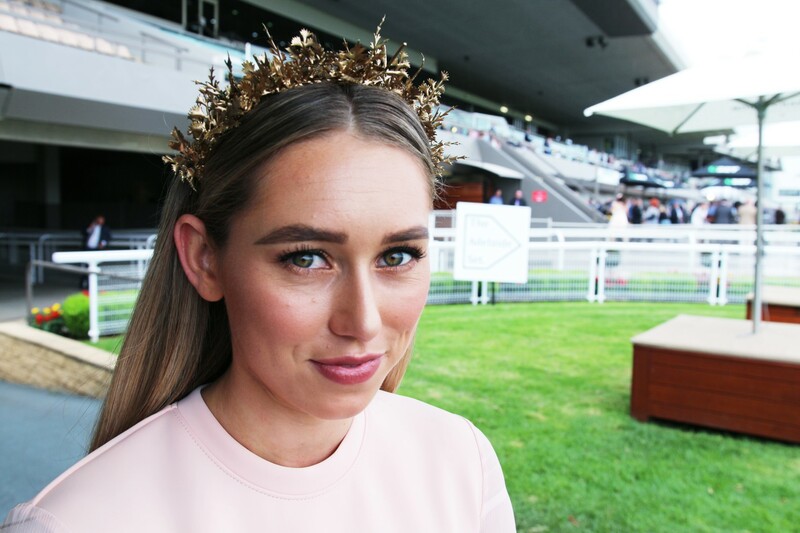 Spiked with golden accessories and a rainbow-coloured clutch, everything about Nicole’s look is perfectly playful for the Schweppes Oaks Day races. And who’s interested in what The Adelaidian wore this year? Well, there was undoubtedly a lot of love for Austrailian Fashion Labels. I went for a skirt and top pastel combo, combining a Finders Keepers bustier, a flowing skirt from Sabo Skirt and a Valentino clutch to match whereby Mel went for black on black with a simple C/MEO COLLECTIVE LBD and a statement avant garde headpiece by Lauder Taylor Millinery in Melbourne. Melissa Zahorujko and Stef Correani at Schweppes Oaks Day Races.